Eco friendly house with 4 bedrooms. This house has been built with the environment in mind. Air Source Heat Pump, rainwater harvester and environmentally friendly building materials have been used to make this house as carbon neutral as possible. The property is ideally located to enjoy the beach, nearby Chichester, local facilities like The Lifeboat in and Goodwood with its horse races and car shows. 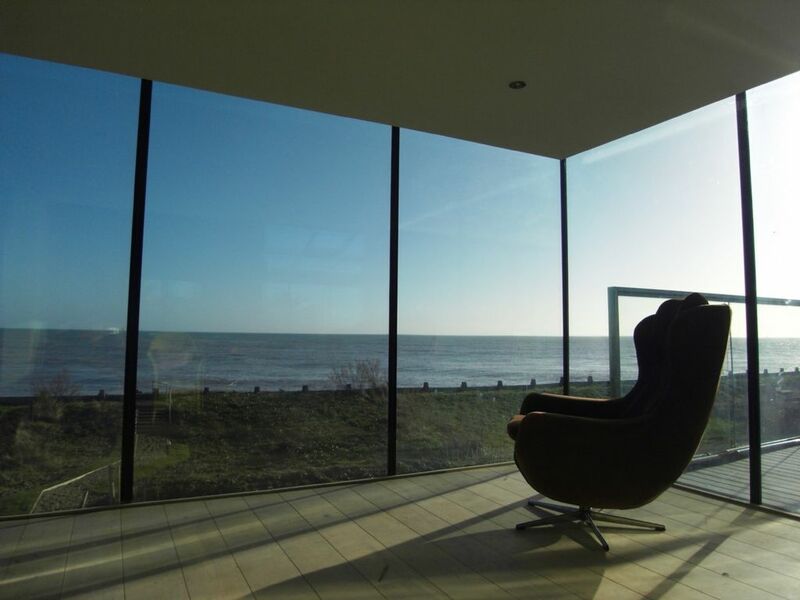 This property is all about its view of the amazing coast and being close to the sea. Therefore it is best suited to people enjoying the outdoor, the sea, the fresh air, the view, the beauty of being indoors but being surrounded by wind, water, sun, sky, stars whilst spending time with family and friends in a relaxed atmosphere ... It is less suitable for people expecting 'formal' surroundings. This property is all about its view of the amazing coast and being close to the sea. Therefore it is best suited to people enjoying the outdoor, the sea, the fresh air, the view, the beauty of being indoors but being surrounded by wind, water, sun, sky, whilst spending time with family and friends in a relaxed atmosphere ... It is less suitable to people expecting 'formal' surroundings. Beautiful modern house right on the beach. Many innovative quirky features, such as a secret bathroom, hidden behind a book case, with a glass roof for lying in the bath and gazing at the stars. The hallway atrium has an old bike hanging from the ceiling, with the front light acting as a hall light! We had a lovely walk along the track to Pagham harbour nature reserve. So quiet and peaceful. We sat on the sunny rear deck, which has a bbq, at cocktail hour and enjoyed watching the sun go down. The ancient city of Chichester is nearby, but we liked the house so much we didn't really want to go anyway. The hot outdoor shower was great for warming up after our daily swim. will definitely be back. Was a fantastic property, well kitted out. We were 2 families with 4 kids and the set up worked really well. Lovely location on the beach and close to some great pubs (a drive not a walk). It rained heavily for our last day and we had several leaks which is the reason for the 4 not 5 stars. We stayed for 2 nights, we had perfect weather and to sit overlooking the sea was just amazing. We didn’t want to go anywhere else so we stayed and made use of the bbq. The double beds were comfy but the singles were a bit hard. It had lovely shower rooms, would have been good to have a DVD player . We loved our stay as this quirky house with amazing artwork and wonderful views. Unfortunately it was a very wet weekend and there were a few leaks which we let the owner know about. Great bathrooms and amazing, large living space with a wonderful log fire. Would definitely stay again with our friends and kids. We had a great weekend. Lovely house and location. As a seaside town, Selsey offers everyone good beaches, clean water, wonderful seafood, excellent sea fishing opportunities and some of the best sunshine in the UK. You will notice that Selsey is a quiet place, not least because there isn't any through traffic, everyone who is here is here because they want to be. Visit the most southerly point in West Sussex. Selsey's history includes a vital link with the D Day landings. Some of the Mulberry Harbours were hidden off Selsey during the build up to the landings. Selsey also proud itself of its link with the RNLI and visitors can visit the boathouse and see, close up, the amazing equipment that modern sea rescue demands. One of the main local attractions is Chichester Harbour. Bright wide expanses and intricate creeks are at the same time a major wildlife haven and among some of Britain’s most popular boating waters. This unique area has quite rightly been designated as an Area of Outstanding Natural Beauty.